We just aren’t sure what to say about Trimline treadmills these days. They’ve had a decent reputation in the past several years in the $1,200 to $2,700 price range, but there have been some shake-ups recently that make things a bit unsure. Trimline is a company that has changed hands several times, at one point even becoming an employee-owned entity. Now it’s owned by Nautilus and there have been talks that more restructuring within that company may affect the future of Trimline treadmills. It would be a shame, really, since the company hasn’t done half bad considering what it’s been up against. These treadmills won’t change the fitness industry, but Trimline machines give a reasonable performance in the price range. There’s also plenty of choice, with eight Trimline models currently offered. 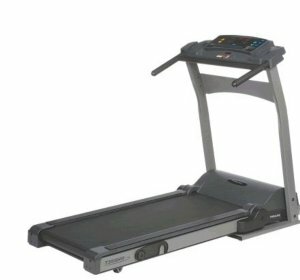 This changes fairly frequently, however, as some treadmill models are pulled from production and others are added. This is probably another side effect of the constant ebb and flow in management and ownership styles. It’s one reason we can’t give Trimline the whole-hearted endorsement we’d like to. There’s just too much chance you’ll run into problems getting replacement parts down the line when treadmill models are discontinued frequently. UPDATE: As we expected, Trimline is now out of business. If you're looking in the $1200-$2700 range check out our Top Picks for a suitable model. Nautilus has made sure that the essentials are made well in all Trimline models. They all have strong decks, heavy gauge steel frames and respectable motors. These are the bones that make up a quality treadmill. Unfortunately, to save a bit on cost, the skin (that is, the trimming) isn’t quite as good on these treadmills. The electronics are okay, but do tend to be a bit slow to register readings and you may run into minor maintenance problems after a few years. 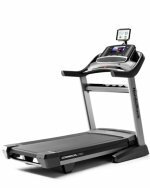 You also get a bit more noise with the Trimline brand than you do with other treadmill brands in this price range. The warranty, however, means that you won’t have to pay through the nose for repairs. With 30 years on the motors and frames and 3 years on parts, you can get quite a few good years out of Trimline treadmills before you have to worry. Trimline T340 - A well-built, high-quality machine that will last for years. Trimline T360 - A good choice for the casual walker. Trimline T370 HR - A high-end model for serious workouts.